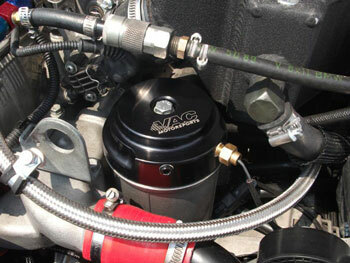 VAC Aluminum Oil Filter Lids provide both form and function. Our lids are precision made from billet aluminum for form, and feature a boss on the back side which can be threaded to allow for installation of oil pressure and oil temperature gauges, for function. Machined with care at VAC in the USA for an exact fit, each of our lids is protected with a clean anodized finish. Raw aluminum covers can pit and corrode looking worn, and improperly anodized covers can impede sensor functionality. We specially tap so your your sensors ground for proper function of all types of sensors. We have tweaked the design of our lids over the years to have enough material to allow installation of mechanical temperature probes, which are longer than others, such as those found on Autometer & some VDO gauges. A sincere effort has been made to make this the best product on the market at any price; a product that will continue to deliver the most accurate readings Vs. any competitors product and stay looking great. Lid is tapped with (2) 1/8-27 NPT holes that can be enlarged or modified for larger sensors that do not conform to this spec. Port plugs are included to block off the ports you dont need or for modifying to your specific needs. From Lawrence Barbieri of Marlborough, Massachusetts on 5/19/2016 . From Anonymous of Redmond, Washington on 11/21/2015 . From Anonymous of Dawsonville, Georgia on 8/27/2015 . From RatedM3 of --, Maryland on 2/28/2012 .